The last Easter before we had to leave our home country! that hovered over the lawn and garden. Jumping out of bed with my nightgown falling down to my toes was a thrill as I ran barefoot out of the bedroom onto the winding porch that hugged the back of the house. 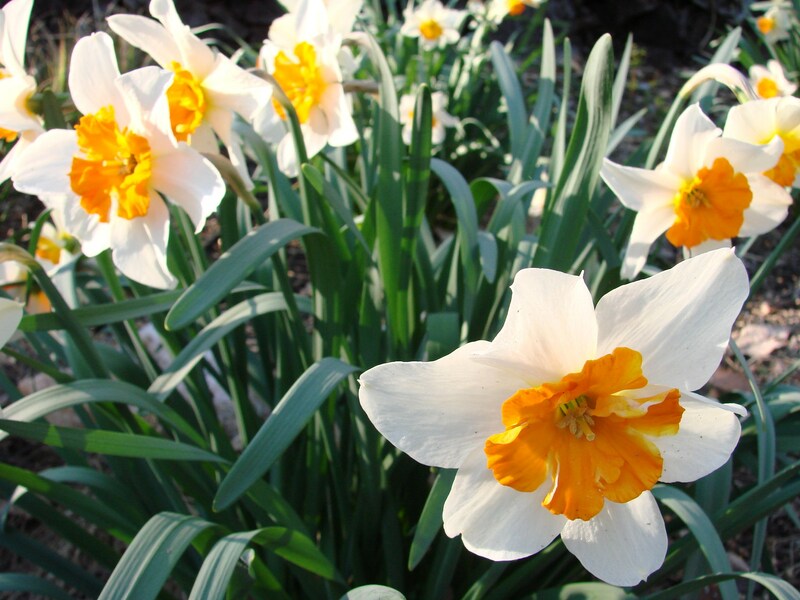 My mother called after me – but I did not want to hear her, I kept running across the lawn and into the vegetable garden, my little brother in tow. 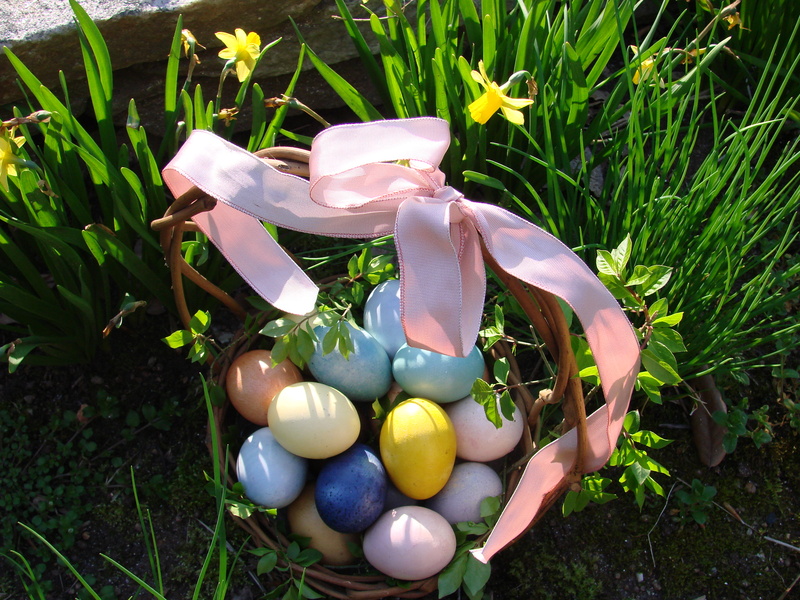 It was Easter Morning and I knew that the Easter Bunny would have left some gifts for us in the garden. 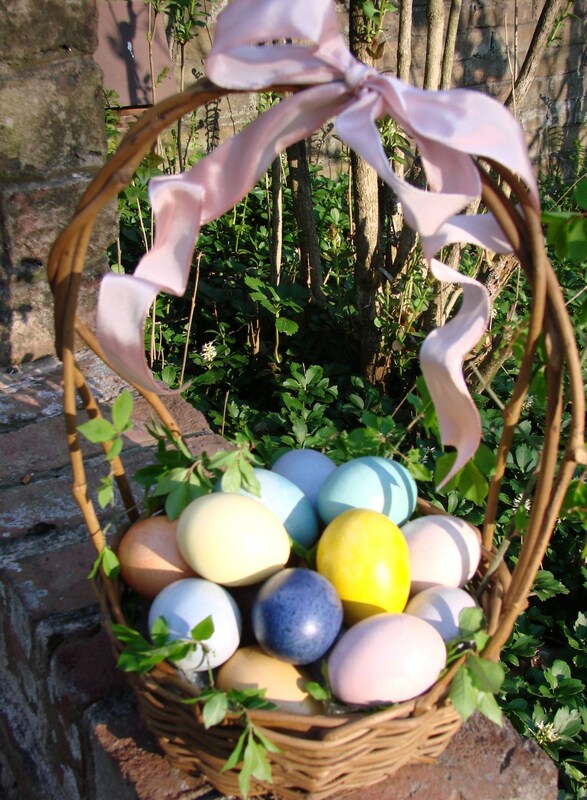 When I opened the gate and took a look around I saw not one nest but several with colored eggs and gifts scattered around in the flowerbeds. Filled in amazement I saw the new outfit that mother told me about, and that I was going to wear to Mass that morning. There were little containers with Candy, oranges and apples all a child’s dream come through. 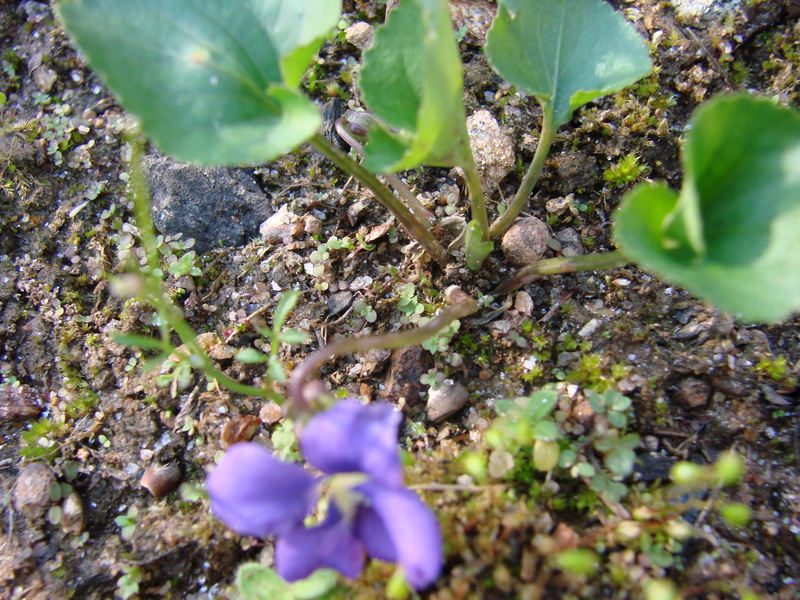 This is the only violet that is blooming in my garden…at this time! This was the last Easter, my family celebrated in my grandparent’s home in Croatia………and I was only seven. 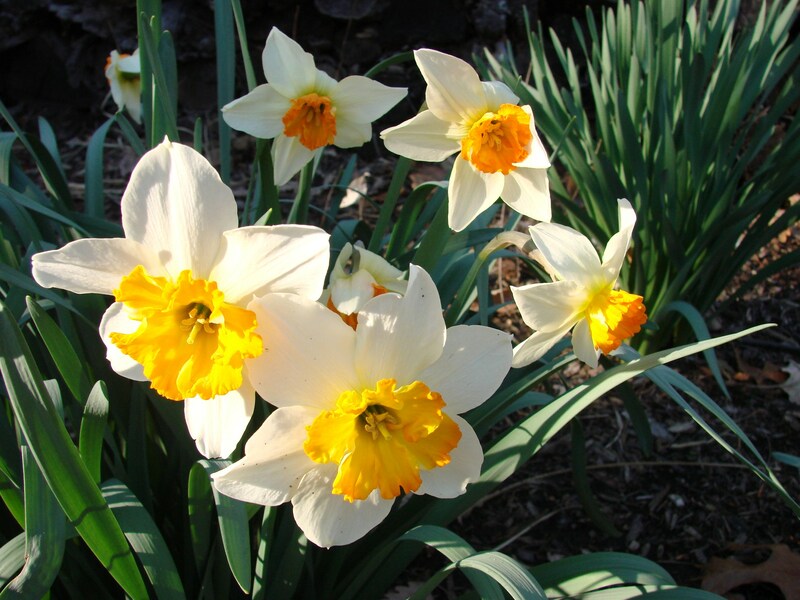 From memories that I remember and stories that were told by my mother and father, Easter was always a very special religious holiday in our family. We went to Church almost every day, or so it seemed to me, during the week before Easter Sunday. We ate certain meals on certain days of the week. On Thursday, it was “Gruen Donnerstag,” (Green Thursday) and we ate green things like creamed Spinach, Boiled Potatoes with lots of chopped Parsley and there was no meat on the table. The week before Easter was a “Fasting Week” when little was eaten and no meat was served. Friday was a bean day, “Bohnen mit Nockerln.” (Beans with Dumplings.) Saturday was a real “Fast Day” where we ate a Fish Soup and noodles, and then came Easter Sunday when there was more food on the table than anyone could imagine. The Feast and Celebration of the Resurrection! We dressed, I in my new outfit, and everyone walked to the village to church. Grandmother and her maids had set the table in the big room and the maids filled it with all the food that had been prepared during the week, while all the fasting was going on. I can imagine how difficult it must have been to bake all the cakes and not be able to eat any of it until Sunday….not even a bite. My grandmother was a very strict person and everyone had to obey her. Needless to say she was not my favorite grandmother, luckily I had my mother’s mother, the other grandmother whom I loved dearly and was spoiled by her thoroughly. When we returned from church the Easter Table was set and was ready for our big feast. A big bowl of French Potato Salad, fresh lettuce salad with violets dressed with a light vinaigrette. All kinds of pastries from yeast dough Kipferln to Braids, Kugelhupfs, Cream Tortes, cookies, apple and quince compotes, and much more. The overflowing buffet was prepared for our meal after church and the many visitors from the village, who came by the house to wish my grandparents and family a Happy Easter. Everyone was immediately invited to have a shot of Slivovic and asked to help themselves to a bite to eat……The visitors did not stay very long because they had other families to see and greet on this so special day. Actually only men came to bring Easter Greetings…..the wives and children stayed at home to greet their guests. Start with eggs at room temperature. In a saucepan bring the water to a rapid boil. Place an egg on a perforated spoon and lower it into the boiling water. When all the eggs are in the water stir them with a spoon – gently – until the water is back to boiling. Lower the heat and simmer for about 18 min. Stir a few more times while the eggs are cooking. After the 18 min………pour off the boiling water and place the eggs at once under running cold water and leave them there until cold. Shell the eggs and leave them in cold water until they are needed. To make halved eggs stand more securely, cut a thin slice from the underside of each half. 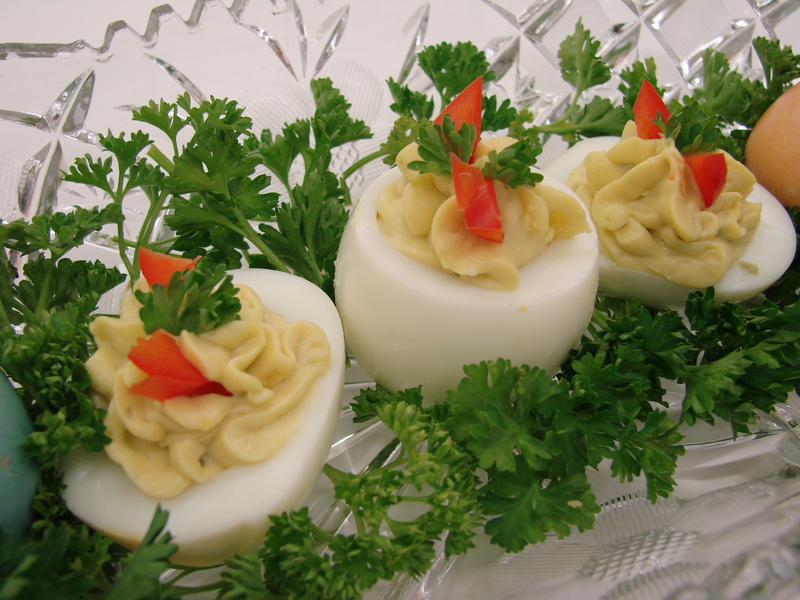 Stuffed eggs can be nested in lettuce leaves or parsley, you do not need an egg platter. Note: Use older eggs…..keep the eggs for 1 to 2 weeks in the refrigerator before hard boiling them. Old eggs are more alkaline and therefore easier to peel. boiling-point. A higher boiling point also seals a cracked egg quicker. Over cooking the egg produces a green layer on the egg yolk. Russian stuffed eggs……this was my mother’s favorite recipe! Halve 6 hard-boiled eggs lengthwise. Into a Food Processor place the yolks, 2 Tbsp mayonnaise, 1 Tbsp brown mustard, 3 Tbsp drained sweet pickle relish, 1 1/2 tsp minced onion, and 1/2 tsp each of dry mustard and salt. Process. Fill egg whites with the mixture and dust the stuffed eggs with Paprika and decorate them with capers and dill. Halve 6 hard-cooked eggs lengthwise. Into Food Processor place the yolks, 11/2 tsp minced onion, 2 Tbsp mayonnaise, 1 Tbsp sourcream and salt to taste. Process. Fill egg whites with the mixture and cover each mound with caviar. Pipe little dots of mayonnaise around the mounds on the egg white. Halve 6 hard-cooked eggs lengthwise. Into Food Processor place the yolks, 4 Tbsp softened butter, 4 tsp mayonnaise, 2 tsp minced onion and 1 tsp each curry powder and salt. Process. Stand a cold cooked shrimp, curve up, in each of the egg whites. Pile the mixture on either side of each shrimp leaving half of it exposed, and flank the shrimps with a few capers on each side. Halve 6 hard-cooked eggs lengthwise. Into Food Processor place the yolks, 1 small can drained, skinless sardines, 1 Tbsp brown mustard, 1 tsp each mayonnaise, minced onion, grated lemon rind, 1/2 tsp lemon juice and salt and pepper to taste. Fill the egg whites with the mixture and decorate each egg with a sprig of parsley and half of a thin lemon slice. Halve 6 hard-cooked eggs lengthwise. Into Food Processor place the yolks, 2 Tbsp anchovy paste or more if desired. Add 2 Tbsp mayonnaises, 1 Tbsp each softened butter and sour cream. Process. Fill the egg whites with the mixture. Sprinkle the stuffed eggs with chopped cashew nuts or almonds – or – curl an anchovy filet on each egg and beside it insert slivers of toasted cashews or almonds. Halve 6 hard-cooded eggs lengthwise. Into Food Processor place the yolks, 4 oz goose liver pate, 2 tsp minced onion and 1 1/2 Tbsp mayonnaise Add salt to taste. If the pate contains a truffle, put a thin sliver on each egg and a tiny sprig of parsley. Halve 6 hard-cooked eggs lengthwise. Into Food Processor place the yolks, 1 tsp minced onion and salt and pepper to taste. Process. Remove blade and add the picked over crab meat with a spoon into the egg mixture. Mix with the spoon and fill egg whites. Decorate with sprigs of parsley. Halve 6 hard-cooked eggs lengthwise. Into Food Processor place the yolks, 1 Tbsp mayonnaise, grated rind of 1 lemon, salt to taste, and 1/2 tsp dry mustard. Process. If the mixture is too dry add a little more mayonnaise. Fill eggs and level them with a knife. Boil 6 small asparagus in salted boiling water until they are just tender. Marinate them in a tart French dressing while they are cooling. Drain them well and place one on each filled egg. Decorate with a small slice of pimento across the center of the asparagus. Halve 6 hard-cooked eggs lengthwise. Fill each egg with a Tbsp of black caviar. Into 1 cup of whipped heavy cream add 3/4 cup freshly grated horseradish, and add the grated rind of 3 lemons. Salt and pepper to taste.Mound the cream in the middle of a serving platter and sprinkle it with chopped fresh chives. Arrange the caviar eggs around the cream. Reserve the egg yolks for another use. Halve 6 hard-cooked eggs lengthwise. Into Food Processor place the yolks, 1/4 cup softened butter, 2 Tbsp mayonnaise, 2 small garlic cloves, salt and pepper. Process. Take the blade out and add 1 Tbsp chopped parsley and 2 Tbsp chopped chives. Mix well. Fill eggs with mixture and decorate with long blades of chives. 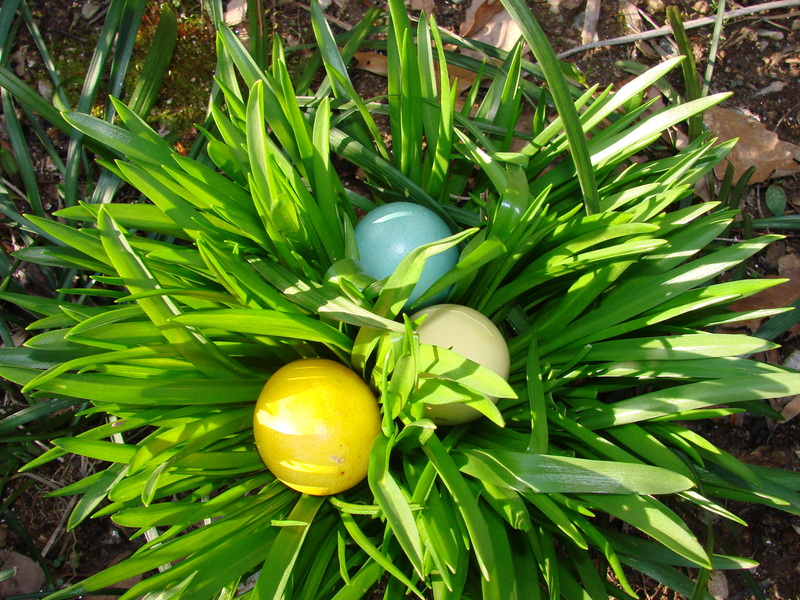 If chives are in bloom, the blossoms can be used to decorate the stuffed eggs. 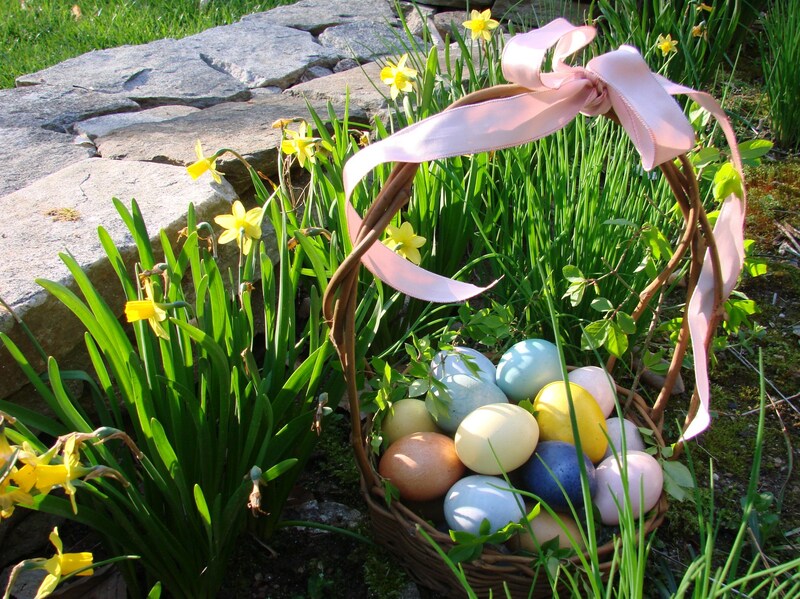 Happy Easter from Maja’s Kitchen! I love hard boiled eggs, but have never been able to make them without me getting so frustrated that I can’t take off the shell. Thanks for your tips, I’m going to take a stab at it again! I am happy that my recipe for “how to cook hard-boiled eggs” are encouraging you to cook them………..
Have a very Happy Easter………. Bitter sweet memories written with a heart full of love – thank you for sharing them, dear Maria . Happy Easter to you! Thanks for the huge amount of recipes for stuffed eggs What we called “Russian Eggs” in our family are the ones sprinkled with a tiny dose of caviar (not the real caviar, my mother used a substitute called “Kaviarersatz”). Dear Schnupp………..thank you for your kind words and comment………. I personally do not like Kaviar…….therefore I chop up some black olives and substitute them for the Kaviar………. Ich wuensche ein recht schoenes Osterfest mit viel Soonenschein und Spass………. Your stories are as wonderful as your cuisine! I am sure you are carrying on some of your family traditions with your own family. Your grandchildren are very lucky to have you! thank you for your nice comment……..you are so sweet!! Hope you are having a wonderful Easter with all your family!!! I also had a very strict German grandmother, but we loved her just the same. 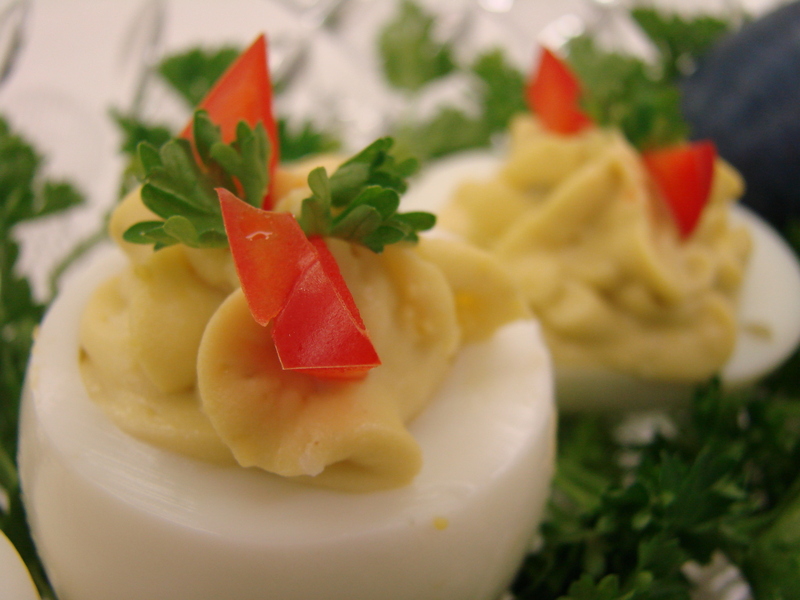 Deviled eggs are my favorite and I love to make them. I look forward to enjoying some of your recipes above. Thanks for sharing them. I am happy you like some of the stuffed egg recipes……. …..blueberry juice? that would be a great way to use my old frozen berries that have a texture like leather!! ….great thanks so much, love EASTER a lot remembering from childhood,,,,, really nice time, Spring, new dress for the little girls, the meal all in family, the flowers, going in the garden to find them……thanks for make me coming back in the time… like the ones who are blue clear blue like a “Turquoise”. I love this idea and just in time to experiment thank Maria too! Such beautiful memories. Thanks for sharing. Great memories that you have shared with us, I love it when you do. Also enjoyed the tips on boiling the eggs. Happy Easter ! Thank you, Donna……….for your nice comment! I wish you a wonderful Easter and God’s Blessings always! !